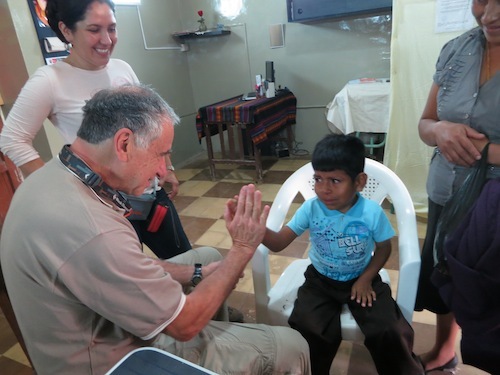 January 2015: FACES takes a team of 28 to Lambayeque, Peru for its 8th Surgical Campaign. We are very grateful to the staff of Hospitals Belen and Regional for their support. In 6 days, we were able to perform surgeries for 46 patients, at no cost to them. Here are some photo highlights of the trip. August 2015: FACES leadership traveled to Peru for the Regional and International Conference on Plastic Surgery. Dr. Thomas Albert, Dr. Dana Smith, and Mr. Kelly Jensen traveled to Chiclayo, Peru to represent the FACES Foundation at the International Conference for plastic surgeons, hosted by Hospital Regional. We are honored to be included in the conference and look forward to further collaboration with our colleagues in South America. October 2015: FACES Annual Benefit Auction: “The Difference of FACES”, Andina Restaurant in Portland’s Pearl District. We had a wonderfully successful fundraising event this Fall: our Annual Dinner & Auction! Thank you to all those who participated and helped to raise over $40,000 for cleft surgeries in Peru. November 2015: FACES conducted patient evaluations for Cleft Lips and Palates in Lambayeque, Peru. Hosted by Hospital Belen. With the support of the Lions Clubs of Lambayeque and the staff at Hospital Belen, FACES team members evaluated 62 patients for cleft surgery, nearly half of whom were returning patients! The need for surgical intervention is tremendous.